I am a blogger. Yet when people ask me if I blog, I kind of nod my head because I truly consider what Vlad and I do more of webmastering than blogging. But Wikipedia says that a blog is a “type of website where entries are made (such as in a journal or diary), displayed in a reverse chronological order”. Ok, so I blog. And I chuckle while I say this because the name of my website is Purse Blog– that should be a dead giveaway that I am a blogger. Yet many people are raging against the mainstream technology world of blogging. Go on and rage with a bag that shows you will defy the world of blogging with a bag that makes the statement. 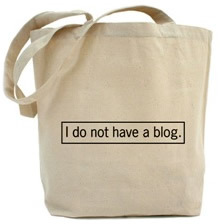 The ‘I do not have a blog’ Tote Bag combines 100% cotton canvas with a 22″ reinforced self-fabric handles and the phrase of those who are going against the norm of the blogging world on the front. Hey, more power to you if you do not blog or know someone who truly cringes at the thought of blogging. Easy to care, this bag is machine washable and measures 15″ x 18″ x 6″. While it is not the hottest handbag out there, it is a great gift (gag gift even) for a mere $17.99 via Cafe Press.